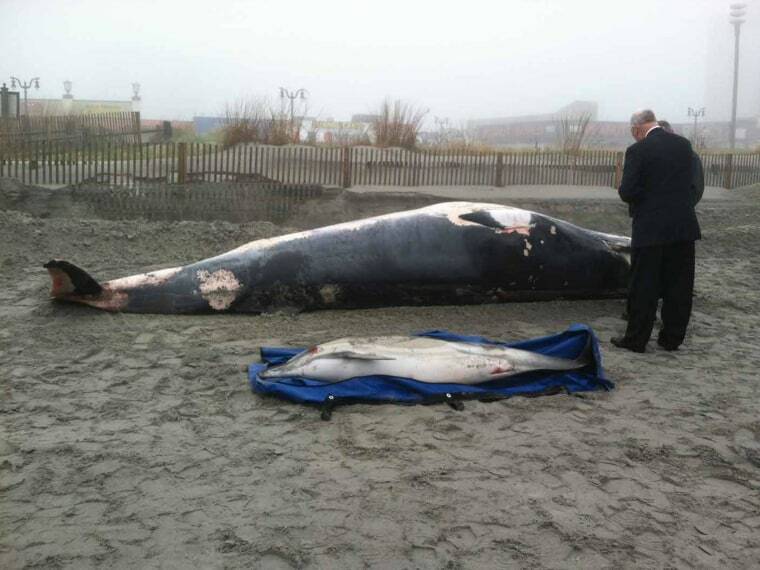 ATLANTIC CITY, N.J. — A dead Minke whale that washed ashore in New Jersey suffered some further indignity: someone tagged it with graffiti. The whale, which was roughly 12 to 15 feet long, was discovered Thursday morning below Atlantic City's Central Pier. Police tell The Press of Atlantic City the purple markings are not gang-related and appear to be Greek letters. The letters appeared to be Tau Epsilon Phi, a fraternity that has chapters at several area schools, followed by what looked like "94." Bob Schoelkopf of the Marine Mammal Stranding Center says the whale appeared to have been dead for several days and washed up during a strong storm. It had no sign of trauma. A state pathologist will try to determine the cause of death.